Science cannot be imagined without laboratory and experiments, laboratory is that place where students extend their theoretical knowledge with the help of experiments and get command over the subject. 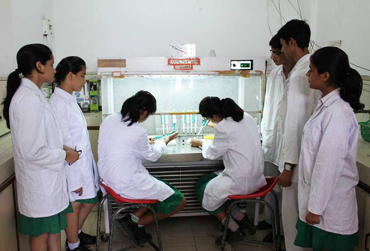 Biotechnology laboratory is one of such hi-tech labs where students are provided hands on practice on latest gadgets and equipments. Biotechnology is an integrated science, a combination of allied sciences and therefore used to have allied effects, it is used to prepare therapeutically and diagnostically important proteins, to manipulate the gene and their expression to improve quality and quantity of the plant and animal products. In this era of biotechnology, students are required to learn the uses of biology, biochemistry, biophysics, genetics, microbes etc. with the application of instruments i.e. technical system to the benefit of mankind. For boosting the knowledge and confidence of the students in this upcoming area, we have biology and biotechnology laboratory which covers an area around 22 ft x 10 ft for biotechnology lab and for biology lab is 45 ft x 22 ft. Laboratory is very well equipped with all required and updated models of instruments. These labs have the capacity to accommodate twenty five students at a time. In our lab, we have autoclave, BOD incubator, oven, electrophoretic units, vortex mixer, water-bath, a small distillation plant, laminar air flow chamber, rotator, trans-illuminator, digital balance, stirrer, pipette, centrifuging machine, spectrophotometer, freeze and many more apparatus and equipments for studying sterilization, microbial culture, DNA isolation, plasmid isolation, separation of DNA fragments and their manipulation etc. There is also a computer set up for bioinformatics to study storage and usage of genetic information of organisms and therefore to predict the pattern of their evolution as well as drug trials. Bio Tech Lab is air-conditioned.